San Diego has been experiencing sudden rains these past few days and this seemed to be the perfect time to get something crunchy and indulgent in our tummies 🙂 When it comes to rains, i become a typical nostalgic North Indian who has to gorge on some (and often unhealthy) snacks and a soothing glass of Masala Chai tea as i believe there is nothing better than some comfort food to enjoy the rains. In Delhi, we would find a rescue to the nearest street food stall (a.k.a Chaat/ snack corner as we Indians say) and grab a plate or two of the famous Dahi Chaat (recipe here) ,fried Pakoras/ Bhajias (recipe here), over stuffed Kachoris (check out my Jaipuri Onion Kachori recipe here) with goodness or the world popular dish Samosas (check my interesting oriental flavour inspired samosas here). As foodies as Indians are, there are just so many options to choose from and we never leave an occasion to satisfy our cravings for such delicacies. 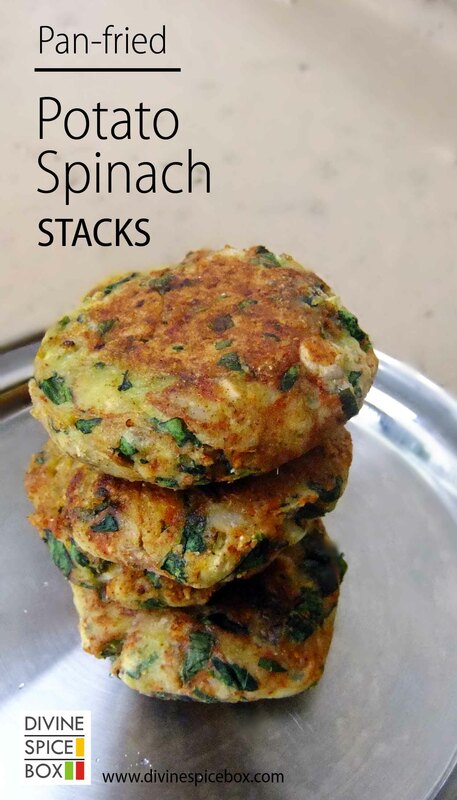 Potato Spinach Stacks are more than pure indulgence : these are healthy, almost oil free and have the goodness of spinach which makes this dish both, interesting to look at and full of flavours. These stacks are so healthy that you can eat it guilt free and make a big stack for yourself before you devour it ! Take a mixing bowl. To this, add in the potatoes and peas and mash well using a hand masher. Next, add in all the ingredients except Oil required for pan frying and combine well till the mixture is homogenous. Do not over mix or the mixture will become too mushy… i like these with more texture and crunch in them. Adding Oil in the mixture helps in getting crunchier texture. Divide the mixture into equally sized portions and form into stacks. Keep aside. Refrigerate for 10-15 minutes. This step will help the potato spinach stack to firm up a bit so that they hold their shape. Take a skillet/griddler and bring to heat. Add in 1 tsp of oil and using a cotton swab, spread the oil to the entire surface of the skillet/griddler. Place 3-4 stacks on the pan and let it roast on medium high flame for 1.5-2 minutes before turning the side. Roast on both the side till crunchy.If you are using a non stick surface, almost no oil is required for pan-frying these stacks. 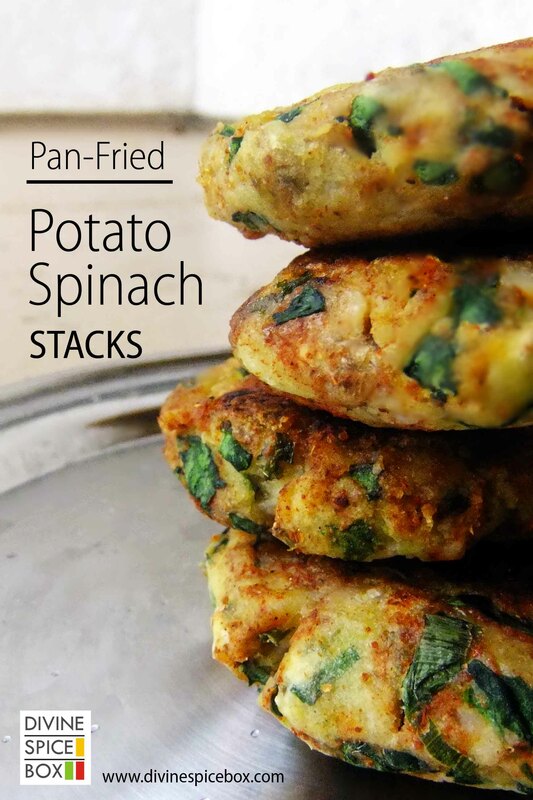 Potato Spinach Stacks are ready. Serve these crunchy stacks with the traditional Mint-coriander chutney or the zingy, zesty tamarind chutney or make it an addition to the DSB Dahi Chaat… and if u want to make it into an International platter, include it as falafels into this All in one vegetarian wrap or serve it with a generous scoop of my roasted pepper hummus or tzatziki and make a side of herb feta salad . I made this dish 2 weeks back and since then i have made this many a times. If u like to eat this often but is discouraged by putting in that much time every single time, just make a big batch and then roast them mid way and then freeze them up ! and when u want, take them out, thaw them and pan roast. Enjoy !! Tagged Healthy, Quick, Spicy, Winter. Thanks a lot Aruna !